ALBANY, NY (November 16, 2015) - New York State highlighted the success of I LOVE NEW YORK China offices and their one-year anniversary. I LOVE NEW YORK representation is based in four China cities: Beijing, Shanghai, Guangzhou and Chengdu. Together, the offices reach travel agents, group tour operators and other travel professionals, as well as media and consumers in more than 20 other cities. Blue Mountain Lake, N.Y. - Following the museum&apos;s Black Friday and Small Business Saturday events on Nov. 27 and 28, #GivingTuesday, (Dec. 1) presents an opportunity to give back, and join in the national celebration of charitable giving. This special day of giving demonstrates the collective power of individuals, communities, and organizations to encourage philanthropy and to celebrate generosity worldwide. 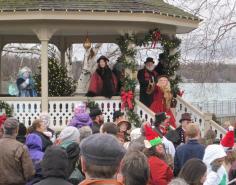 Opening Day Is Nov. 27, "Bright Friday"
Skaneateles, N.Y. - Visit Skaneateles this season, and you&apos;re guaranteed to have a Happy Christmas. Imagine, if you will, that the year is 1842. Queen Victoria has arrived in Skaneateles, the teasel capital of the world, to meet with President John Tyler. Accompanying her is Charles Dickens, whom she has commissioned to write a story about Christmas. "My hope is for a story that will illustrate the virtues we may find at Christmastime. That, and entertain my nine children," says Queen Victoria, portrayed by Maria Wechsler. Stroll, Skate and Celebrate in December! village of Lake Placid invites all to experience a festive start to the season as it hosts the 7th Annual Holiday Village Stroll, complete with holiday shopping, family fun, arts and entertainment from Friday, Dec. 11 through Sunday, Dec. 13, 2015. Albany, N.Y. (November 19, 2015) - Governor Andrew M. Cuomo hosted the third New York State Tourism Summit in Albany yesterday, where local and international tourism leaders met with State officials to explore new industry opportunities. At the summit, a commitment of $50 million was unveiled to promote statewide tourism, create jobs, and attract more visitors to every region of New York. This investment, which is one of the largest ever by the State, builds upon the historic investments in the tourism industry which generated a $100.1 billion economic impact in 2014. Annual Holiday Shopping & Dining Night – Think Local! Ticonderoga, NY - November 16, 2015 - The Ticonderoga Area Chamber of Commerce in coordination with area businesses will host the annual Holiday Shopping & Dining Night on Friday, December 4th as part of the 6th Annual Ticonderoga Area North Country Christmas Celebration. Shopping and Dining Night is an opportunity to take advantage of great specials and promotions. Support Ticonderoga Area Businesses, listen to live music and get into the holiday spirit. It’s the Perfect Time to Visit Hard Cideries in Orange County, N.Y.
Orange County, N.Y. (November 5, 2015) - With the grand opening of Angry Orchard in Walden, N.Y. on Friday, and plenty of events on tap, hard cideries are the place to be this holiday season. It&apos;s the perfect time to visit a tasting room and plan pairings for the upcoming Thanksgiving meal. "Orange County&apos;s long history of beautiful apple orchards make it a prime spot for the exciting craft cider culture that has taken off in recent years," said Orange County Tourism Director Susan Hawvermale. 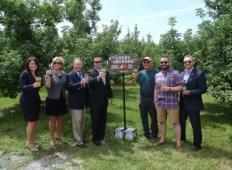 "We&apos;re excited to welcome Angry Orchard to the Orange County craft cider scene, and now visitors can taste this delicious beverage at five different cideries around the county." Ticonderoga, NY - November 3, 2015 - The Ticonderoga Area Chamber of Commerce in coordination with area businesses and organizations will host the 6th Annual Ticonderoga Area North Country Christmas Celebration from Friday, November 27th through Sunday, December 6th, 2015. The celebration will kick off with events such as Small Business Saturday and the arrival of the Canadian Pacific Holiday Train, as well as include new events like the Holiday Farmers&apos; Market. ADIRONDACK REGION, NY (November 3, 2015) - Winter comes early in the Adirondack Mountains, and with it, the promise of holiday festivities guaranteed to turn any Scrooge or Grinch into a Saint Nick or Rudolph. 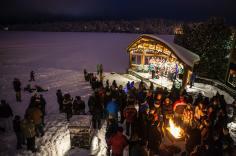 Throughout the holiday season, the Adirondacks are quiet and snow-covered, providing the perfect winter getaway for families or couples looking to enjoy ice-skating, horse-drawn sleigh rides, and relaxing evenings in front of the fire with a seasonal cocktail.